The purpose of this web application is to showcase and share Indian epidemiological data. As part of its dissemination strategy, CGHR is continuously looking for new ways to share its research findings. This application allows users to explore and download epidemiological data via an interactive map. We hope that government officials and the general public find this application very useful. 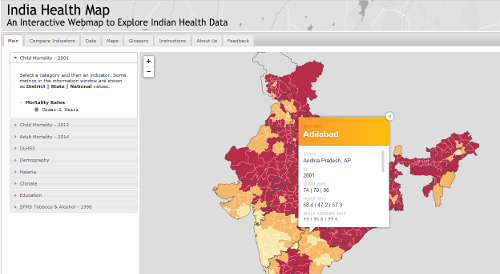 Click here to access India Health Map.